Go on a walking tour. 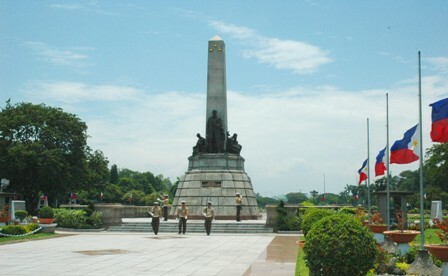 Though many parts of Manila have been urbanized, there are places that are still teeming with history, and what better way to know about these places than by going on a walking tour, conducted by experts, some of them celebrities in their own right. Among the best walking tours are the ones conducted by Carlos Celdran. Fun fact: this guy got arrested about a couple of years ago because he had the chutzpah to dress up in Spanish colonial clothes, then he held up a sign during a live mass in Manila. The sign said “Damaso”. It was a protest against the church’s stand on reproductive rights in the country. The fact that the man served a bit of jail time didn’t diminish his spirit—in fact, he got more famous because of it. His walking tours are described as comedy, performance art, and melodrama in one. He regularly does tours of Intramuros, as well as a tour called “Livin’ La Vida Imelda”, a tour about a former first lady’s accomplishments, eccentricities and fabulousness. Yes, the very same Imelda, with the humongous shoe collection. Do the tourist thing. It’s ok, most tourist traps are fun, though your well traveled friend who spends summers in the heart of the Amazon might laugh at you. So how does one do the tourist thing in Manila? Easy. 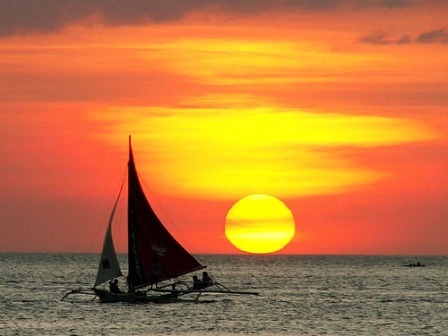 Start with a stroll around Luneta Park, followed by a few minutes of gazing at the sunset while eating chips (or balut, if you dare) at Manila Bay. Do a bit more walking towards the Mall of Asia, one of the world’s largest malls to cool off a bit and perhaps buy some souvenirs, then cap off the day with dinner at a place that serves authentic Filipino food. Dencio’s is such a place, and it’s located right in front of the mall. Have your fill of dishes such as sizzling sisig, crispy pata, shrimp, and kare kare. Or if you want fresh sea food, head on over to one of the many “Dampa-style” restaurants in front of the mall, wherein you go to a small market, buy some fresh sea food, then go to one of the restaurants and have them cook the food to your liking. Cap it off by enjoying a frosty cold bottle of San Miguel beer during dinner, and there you have it—the whole tourist experience. Take a drive going to Tagaytay, which is only about a 2-hour drive from Manila. The weather here is cooler and more pleasant compared to the heat of the city, and this is where most Manileños go to cool off. There’s a dearth of activities that one can do here, such as having a picnic lunch in People’s Park, ziplining, visiting the zoo, going on a boat ride towards a small volcano in the middle of a lake, visiting a bee farm, going for a ride on a horse, or enjoying the splendid cuisine that can be found everywhere. The specialty of Tagaytay is its bulalo—chunks of beef simmered in a clear broth until tender, with pieces of corn still on the cob, and pieces of potato and cabbage making the soup hearty and filling. Best eaten with rice, the dish alone makes the trip worthwhile. Located on the north side of the country, approximately a 6-hour drive from Manila, Baguio is where you want to be to get away from the heat, just in case Tagaytay isn’t frosty enough for your liking. The cool weather draws visitors to this place all year round, along with the attractions that can only be found here. A trip to Asin Road to go rappelling down an underground cave is all at once spooky and delightful for thrill-seekers. Those on a religious pilgrimage will want to climb up the 252 steps leading to the statue of the Virgin Mary in Lourdes Grotto, an effort which some believe will cause their wishes to be granted if one doesn’t stop to rest during the ascent. The climb is usually followed by a visit to the Good Shepherd Sisters Monastery, where one can buy the best strawberry jam and ube preserves in the country, made especially by the nuns. For horseback riding, one may rent a horse at Wright Park, then go to Mines View Park to buy some souvenirs. Another park worth visiting is Burnham Park, located right in the heart of the city, and you can enjoy a relaxing boat ride in the lake, or even have a picnic lunch at the grounds. People who love the Baguio of old will always make time to pass by The Mansion, the official summer residence of the President of the Philippines. 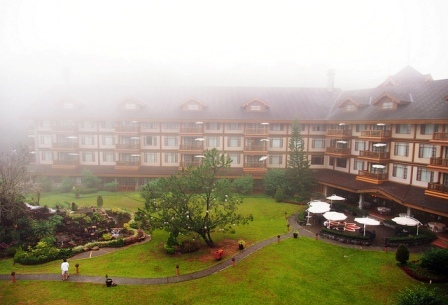 Camp John Hay is also a popular destination, with its log houses and green golf course that draws a lot of avid golfers during the summer months, and for a long time people often referred to it as “Little America”. The newest thing that Baguio is famous for is undoubtedly its ukay ukay stores. Ukay means to dig, and that’s what you’ll do once you get to an ukay ukay building, you’ll literally dig for the best finds in these second hand stores. Ukay ukay is a rabid fashionista’s secret, as many hushed tales of finding an authentic Chanel or Prada item among the dusty bins for a couple of hundred peso bills is the stuff that fashion legend is made of. If diving for dusty cast-offs isn’t your style and you want to take home real Baguio art, the Wood Carver’s Village is three kilometers of independent indigenous wood carvers. The works of these carvers range from very small figurines to huge statues, making this a perfect place to visit if you want to take home some authentic Baguio souvenirs of if you want to furnish your place with some local art. To see how much Baguio has grown throughout the years, take a walk down Session Road. This is the main thoroughfare of the city and has a variety of shops, stores, and offices lining each side. This is where you’ll find department stores, bazaars, movie houses, restaurants and groceries, with some of them having been around for decades. This is a prime spot, the starting point of all parades, and the most direct route to anywhere in Baguio. Stay tuned for the second part of this article, where we’ll venture towards the South and feature the beautiful Bicol province, Cebu City and Boracay!